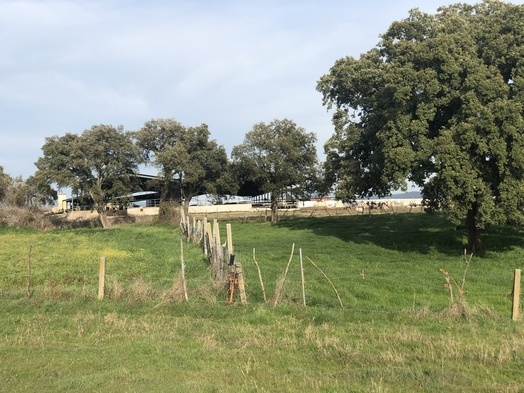 03-Mar-2019 -- This is the last out of four reports reaching confluence points during a bicycle trip from Lisbon to Madrid. The story starts at 40°N 8°W and continues from 40°N 6°W. Indeed I managed to reach this confluence as the second one of this day before sunset. My route was somewhat suboptimal – following the gravelled service roads of the motorway A-5. Finally, I reached the town Velada, located 3 km south-east of the confluence point. After cruising through the alleys of Velada, I continued on an unsealed track to the confluence. Again, the distance from the road is less then 100 m, i.e. 70 m and therefore officially sufficient to document the confluence from the track. But it was easy to crawl under the fence and walk across the meadow to the confluence. There was a second fence just 4 m from the confluence point, which I decided not to scale. There is a huge cattle farm 100 m from the confluence point. I could see 100+ cows there – but the confluence was cow-free. After the visit, I continued my trip further east and reached the town Malpico de Tajo. The next day I skipped the confluence 40°N 4°W which I had already visited 10 years ago. Therefore I managed to cycle to Madrid and also to catch my flight back to Zurich that day.